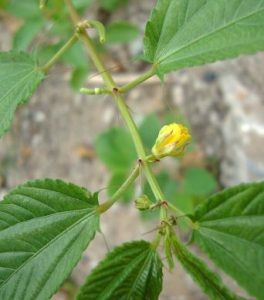 Corchorus olitorius, commonly known as Nalta jute, tossa jute, Jew’s mallow, West African sorrel and bush okra, is a species of shrub in the family Malvaceae. It is the primary source of jute fibre. The leaves and young fruits are used as a vegetable, the dried leaves are used for tea and as a soup thickener, and the seeds are edible.